This general purpose hand held unit incorporates advanced features normally only found on expensive top of the range models, such as high / low sensitivity switch, headphone jack, and LED operation indicators on upper and lower faces to cater for left or right handed operators. It`s low price makes this unit a natural choice where budgets are tight, whilst it`s great balance gives it a lightweight feel making it comfortable for extended use by male or female operatives. A favourite with nightclubs, event organisers, football clubs, galleries and public buildings, etc. An excellent general purpose lightweight hand held metal detector designed to endure 24 hour continuous use and abuse in the toughest working environments. 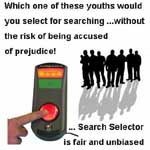 This well proven unit is supplied worldwide where users include Airports, Police Forces and the Military among others - ideal for screening of people at airports, football entrance gates, night clubs, etc. Widely used, this unit offers a choice of audio / visual or discreet vibro feedback - ideal for screening of people at airports, football entrance gates, night clubs, etc. The most sensitive unit in our range, this versatile ultra high sensitivity, rapid detection unit is ideal for a wide range of applications including; detecting small metal objects concealed in body cavities, detecting metal objects ingested by infants or patients, etc. Users include; mine operators (precious metals), the prison service, hospitals, forensic laboratories, and many other users who require the very highest level of performance and detection. Sensitivity: rated at better than 0.03 grams detection mass (continuously adjustable) - ultra fast `detect-alarm-reset` ready for another target - 0.1 seconds.